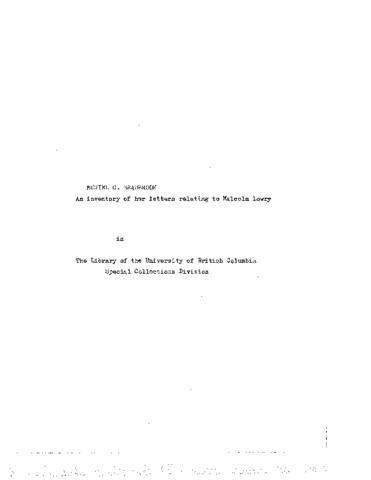 Muriel Bradbrook, Mistress of Girton College and Professor of English in the University of Cambridge, wrote the book "Malcolm Lowry, His Art and Early Life" (1974). The fonds consists of sixty-six letters (1962-1975) between Bradbrook and several individuals pertaining to the life of Malcolm Lowry. Also included are Bradbrook's notes on conversations with Wilfred Lowry and Russel Lowry, information on Lowry from a number of sources, and a list of Lowry's contributions to The Fortnightly.